Flattery makes people more responsive to persuasion. We all want to be loved. 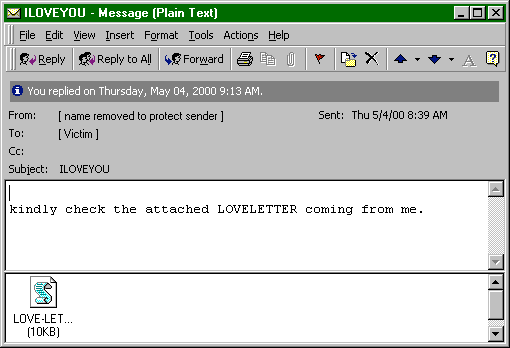 On May 4th, 2000, people all over the world started receiving an e-mail purporting to be from one of their friends telling them that yes, in fact the friend did love them. That prompted enough people to open the e-mail attachment that 10% of all computers attached to the Internet were infected with the virus lurking in the message, causing an estimated $5.5 billion of damage. All caused by a tiny piece of socially engineered flattery. A love letter? For me? From a friend? Of course I’ll open it! If you give LinkedIn $20 per month, they will tell you who loves you – or at least who has been viewing your profile. It seems we’re so desperate for praise that we don’t filter it in the same way that we do with criticism. Even if we’re aware that the praise is synthetic we still accept it on a subconscious level. Flatter people and they will see you more favorably (and thus be more likely to purchase from you), even if they are conscious that the flattery is insincere or undeserved. Make sure the flattery you provide is the first piece of esteem building that takes place. Chan and Sengupta found that if consumers’ self-esteem was raised before the flattery occurred, then the conscious recognition that this was insincere flattery outweighed and overruled the subconscious longer-term positive effect. Label people and then make a request of that label. For instance, tell someone they are obviously discerning, environmentally conscious, and likeably geeky. Then, ask them to buy your green gadgets. The labels can be relatively generic, based on the typical positive characteristics of site visitors. Monetize anxiety and insecurity by allowing people to pay you in order to see more details about their relationship with other site members.